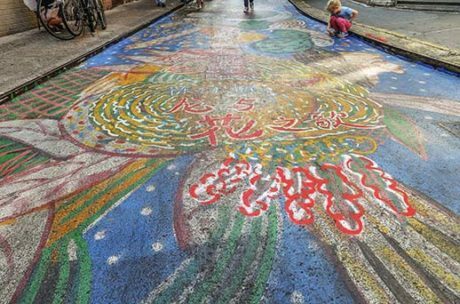 If you go to Chinatown, New York city, you’ll see that the famous and historic Doyers Street has had a colourful makeover with Liquitex paints. 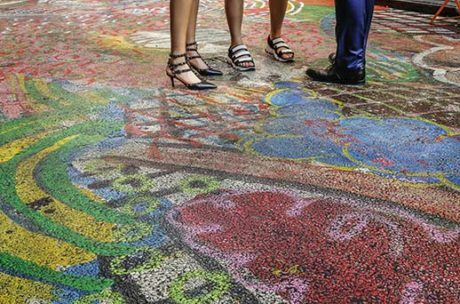 Artist Chen Dongfan has transformed the 4,800 square foot of asphalt leading from Pell Street to Bowery which is lined with historic shops and restaurants like the Nom Wah Tea Parlour, the first to open in New York City in the 1920s. 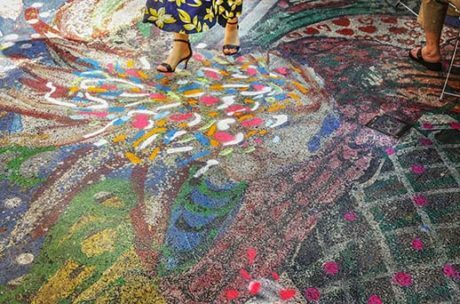 The mural ‘The Song of Dragon and Flowers’, is the work of artist Chen Dongfan (@chendongfan.) The artist has chosen to capture the soul and spirit of the dragon, as a visual embodiment of the area and the lasting Chinese cultural heritage. The flowers are a symbol of peace in response to the history of the neighborhood. The mural, which was completed over a number of days, will remain for three months and was recently featured on the New York Times, you can read the article here. Chen used a variety of Liquitex products to create this ambitious artwork from large tubs of acrylic paint to specific colours of Liquitex spray paint. Liquitex has a successful reputation for providing materials suitable for challenging outdoor artworks, in 2016 Liquitex gold paint was successfully used for Corrie Baldauf’s ‘Gold Zero’ project which involved painting a giant golden zero on the roof of a car park in London. You can find out more about Gold Zero here. Liquitex is also well-known for supporting non-profit projects in New York city organised by Artbridge. 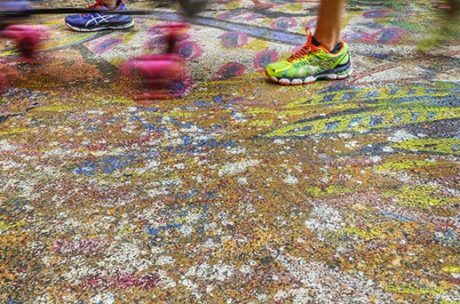 Also in 2016 Liquitex supported another successful project in Harlem, which you can find out more about here. Artbridge is a New York based non-profit charity which empowers emerging artists to transform urban spaces. New York City currently has a staggering 225 miles of street-level construction scaffolding. This ubiquitous construction eats away at the fabric of our neighborhoods. Since 2008, ArtBridge has transformed this eyesore into a canvas for local, emerging artists. These exhibitions have resulted in incredible exposure for artists, while artfully reinvigorating New York’s urban landscape. Find out more about Artbridge here.